Never has a puzzle been this adorable or this fuzzy! This 300-piece puzzle has faux cat hair and features dry-erase speech bubbles so you can add your own kitty quotes. 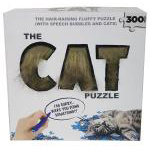 It's the purrfect puzzle for any fan of our furry, feline friends. Measures 18" x 24" when complete.